As some of you may have already noticed, a recent Origin update apparently changed the client’s way of operation, which among else rendered Bibber’s fixed launchers for The Ultimate Collection useless. This means that other community fixes, parameters and mods won’t work with these versions of C&C games. There is currently no solution to this problem, but we will keep you posted once there is. It’s time for Throwback Thursday again! 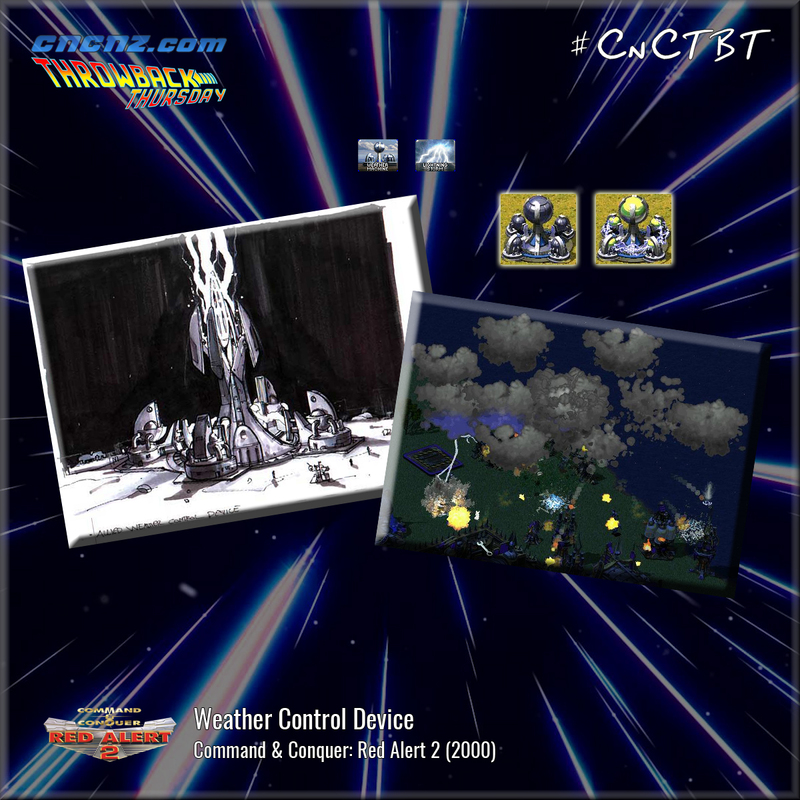 This week, we remember one of the more bizarre superweapons in Command & Conquer – the Allied Weather Control Device from Red Alert 2. Developed by Albert Einstein (because of course it was), this device was capable of firing a beam into the sky which would move clouds above a designated area in order to unleash powerful lightning storms which could electrocute infantry and demolish lighter and moderately armoured structures. This one shows how the Command & Conquer series, and particularly the Red Alert universe, was no stranger to quirky technologies. Remember, you can click on the preview to see a larger and more detailed image. Don’t forget to check out the Throwback Thursdays archives if you’ve missed a week. Check back again next Thursday for another Throwback. Send in your ideas for future instalments. We also encourage you to share this on social media using the hash tags #ThrowbackThursday, #CnCTBT and #CNCNZTBT. I wanted to write something to have my final goodbye and officially sign off as the webmaster, founder and lead administrator of CNCNZ.com. So decided to write an article addressing stuff such as the closure announcement, change of ownership and my final thoughts. Is short, to the point and hopefully answers everyone’s questions. You can read the entire article right here. And with that I’m done. As I wrote just under a month ago. It has been an honor and privilege to serve as webmaster of this site but now its time to step aside. Long live Command & Conquer! I wanted to write something to have my final goodbye and officially sign off as the webmaster, founder and lead administrator of CNCNZ.com. So I decided to write an article addressing stuff such as the closure announcement, change of ownership and my final thoughts. It is short, to the point and hopefully it answers everyone’s questions. You can read the entire article right here. And with that I’m done. As I wrote just under a month ago. It has been an honor and privilege to serve as webmaster of this site but now its time to step aside. 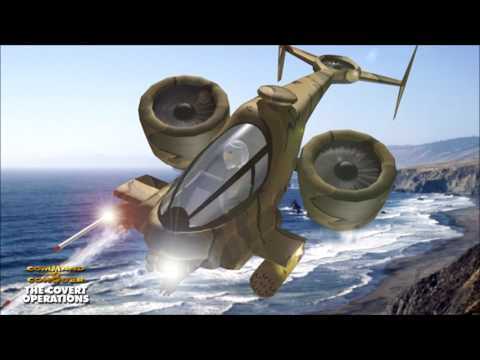 This week’s Music Monday feature goes back to 1996 and The Covert Operations expansion for the original Command & Conquer. Re-Con is a very atmospheric track, and although rather silent, it sort of announces something that comes after it. A new track will be posted next Monday. And as always, don’t forget to share this on social media using the hashtags #CnCMusicMonday and #MusicMonday. Another patch, version 3.1.2.0, for W3D Hub’s Red Alert: A Path Beyond has been released. Apart from the usual array of balance changes and bug fixes, the help screen has been revamped, buildings’ interiors receive new props, the “Militant Force” track now plays at the ending score screen like in the original Red Alert, the Missile Silo’s basement received a window to the missile tube which closes during the launch phase, and some new purchase quotes have been added to some APB-specific infantry units (Sergeant/Starshina and Captain/Kapitan). Despite receiving an official mod SDK and fan-made tools that are compatible with it, Red Alert 3 got few mods when compared to its predecessors. However, one mod for Red Alert 3 took the spotlight recently – Eastern Loong. Its selling point is the addition of the fourth faction, China, with its own visual identity and techtree. It has its own way of building structures – having them drop from the sky, and the units are fully voiced, albeit in Chinese, since the development team is from China as well. There’s even an article on Kotaku about the mod! Check out the mod’s ModDB profile page and give it a run. W3D Hub posted some updates on their upcoming projects recently. Firstly, they showcased new models of the Navy SEAL’s C4, Soviet doors and the Patriot Missile Site for Red Alert 2: Apocalypse Rising. Then, we got a look at assets made for release 2.0 of Tiberian Sun: Reborn, namely the GDI and Nod Limpet Drones, the Mutant Hijacker’s wrench, and the new riot shield for GDI Riot Soldiers.